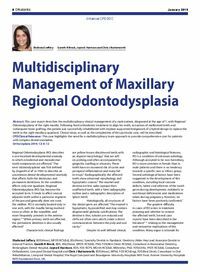 Abstract: This case report describes the multidisciplinary clinical management of a male patient, diagnosed at the age of 7, with Regional Odontodysplasia of the right maxilla. Following fixed orthodontic treatment to align his teeth, extraction of malformed teeth and subsequent bone grafting, the patient was successfully rehabilitated with implant-supported bridgework of a hybrid design to replace the teeth in the right maxillary quadrant. Clinical steps, as well as the complexities of this particular case, will be described. Clinical relevance: This case highlights the need for a multidisciplinary team approach to provide comprehensive care for patients with complex dental anomalies. Author notes: Shahrzad Jeffery, BDS(Hons), MFDS RCS(Ed), BSc(Hons), Specialty Dentist in Paediatric Dentistry (Alder Hey) and Associate Dentist in General Practice, Gareth R Brock, BDS, BSc(Hons), MFDS RCS(Ed), PhD, FDS(Rest Dent) RCS(Ed), Consultant in Restorative Dentistry, Birmingham Dental Hospital, Jayne E Harrison, BDS, FDS RCPS, MOrth RCS(Ed), MDentSci, PhD, FDS(Orth), FFDT RCS(Ed), Consultant Orthodontist, Liverpool Dental Hospital and Chris J Butterworth, BDS(Hons), MPhil, FDS RCS(Eng), FDS(Rest Dent), Consultant in Oral Rehabilitation, Liverpool Dental Hospital, The Royal Liverpool and Broadgreen University Hospitals NHS Trust; Aintree University Hospitals NHS Foundation Trust, UK. Objective: To understand the clinical presentation of Regional Odontodysplasia and be able to describe a typical multidisciplinary team approach to managing several adjacent teeth with complex developmental anomalies.